In the mid-1960s, 70% of the winegrowers (175 vintners) decided to join forces and found the Unión de Cosecheros of Labastida, which currently ranks as the largest co-operative winery in the Basque Country, with a production capacity of 7 million litres. Right from the outset, these winegrowers wanted to be involved in the entire process, from cultivating vineyards to barrel-ageing wine to bottling. Labastida is a traditional wine-making village. There records of winemaking go back to several centuries, but probably the best evidence is the existence of "lagares rupestres," man made formations carved into large rocks in the vineyards consisting of three holes where the grapes were pressed to obtain the juice prior to fermentation. These monuments were used between the IX to the XVIII century. 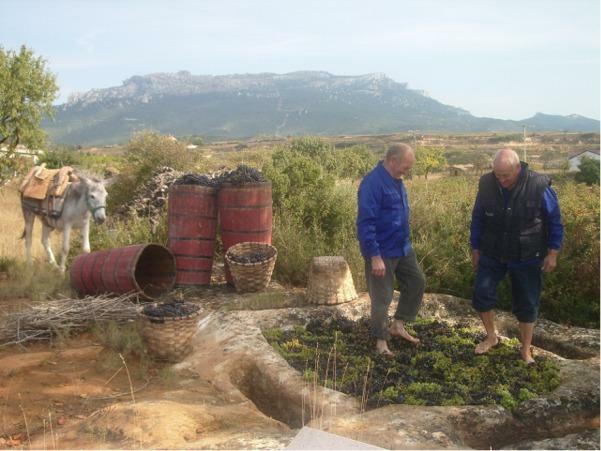 In the late 18th century, a monk from Labastida named Manuel Quintano traveled to the Medoc area of Bordeaux to study winemaking and aging and was the first to bring these techniques back to Rioja and produce wines using the french methods. His house is located on the grounds of Bodegas Labastida. The co-op has established its own brands and striven to enhance its facilities, equipping them with the most modern equipment available, as with its stainless steel tanks, a cooling unit for regulating fermentation temperatures and new bottling plant. The ageing of wines has always been one of this winery's passions and primary concerns. At present, the co-op has 6.000 American oak casks in storage, with an average age of five years. The winery employs precision viticulture techniques using the latest technology to track the vegetative cycle. Bodegas y Viñedos Labastida has developed a pioneering system of weather stations that allows the winery to monitor their vineyards' health and thus prevent diseases that might damage the grapes. The weather stations, located in six different vineyards in Rioja Alavesa, gather information and send it to a GPS system whose main mission is to forecast diseases such as mildew, botrytis or oidium, which may be harmful for the plants. César Castro, Viticulture Director at Bodegas y Viñedos Labastida, is delighted with this technology. With success rates of 80% for mildew and 60% for botrytis, his optimism is well founded. But the use of this technology goes further - the stations also forecast the impact of climatic factors on the vines and soil. Rainfall levels, solar radiation, leaves' and vines' humidity and wind speed and direction are some of the parameters measured by electronic sensors installed on the stations. Castro is the man in charge of interpreting the data sent by the GPS back to the winery. The numbers on the screen of his laptop help him measure the amount of water required by the vines or the impact of southerly winds on the grapes. Putting all that information into good use is crucial to obtain great quality wines. The quad used by Castro is to get to his weather stations is more than just a means of transport. The four-wheeled vehicle incorporates a sensor that sweeps the vineyards to draw an extremely precise map of the vineyards and measure the vigor of the leaves. "A vineyard with a high level of vigor may produce grapes that are unsuitable for vinification, while others with less vigor could be of better quality", Castro explains. "High-tech viticulture helps to make high quality wines".